The Ordinary Life of an Extraordinary Girl: Why? As I finish this year long narrative on Alex’s live I want to tie up some loose ends. Alex is back to her normal self, a 17 year old teenager with mood swings. She is basking in the aftermath of her success at the National Games; our local paper printed a follow-up story and Alex is going to be honored by our town and at a town council meeting in a few weeks. People we see on the streets congratulate her and she loves her status as a local hero. The music and Disney Channel are on often and the food battles are back. I take Alex everywhere I go, as I do not want to leave her at home with food. This weight issue, although currently stabilized, has the potential to become a health problem. To the best of my ability, I will fight this. Our tiny frogs, James and Jack are getting large; we are surprised they are still with us. We miss our beloved dog Lucy. The kids and I still want another dog (John does not) so our pleading for a pet has reached the cat compromise stage. Alex is not getting a horse. I have not found a job, although I have been on a few interviews. I am enjoying my freedom, but this cannot last. The real estate market has not picked up and it is possible John may take a job in a different state and commute home once a month. As we say “it is what it is”. Anyone want to buy a house in the Aspen area? Why did I start this blog and why am I planning to stop? These are great questions and after some thought as well as a number of draft responses I have come up with the following answers. I set out to document this past year in Alex’s and our lives. Participating in the National Special Olympics can be a life changing event for a teen with disabilities, as well as her family. I hoped to keep a record of this momentous event in our lives. My overriding vision was the belief that we have a story to tell. A story of an unexpected birth and the magic that came into our lives 17 years ago. I never expected to have a child with special needs; no one does. This journey has been challenging, difficult and demanding. It has also been an opportunity to have a life I never knew existed and has been rewarding and fulfilling. I would not change anything about our family and Alex. Very simply, I want to educate others. This is a lesson for families with young children with down syndrome, as well as all families who know people with down syndrome. This lesson - people with down syndrome are just like their peers; same dreams, same hopes for the future and same challenges. It is my sincere hope I have accomplished this. 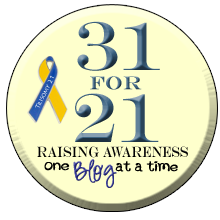 Why do I want to stop this blog? This is the question have I have thought a lot about. My goal was to create a body of work that could be used to educate others; a project with a beginning and an end. This does not mean I always, or ever, do the right thing for Alex. Many times I take the long and curvy road, but I have learned to stay on the path and commit to a direction. Sometimes I am too optimistic and sometimes too pessimistic, but I always believe I can make a difference. I have had over 15,000 hits in these 11 months, with hundreds and hundreds of readers from across the world. Many of these readers have sent me comments of support and encouragement. Some mention younger children with down syndrome and are intrigued and even inspired by Alex’ successes. I am humbled by these remarks. I have learned over the year that I like writing and especially writing about Alex. I find this very surprising and even cathartic, as I was never a person to keep a journal. I have discovered I would like to continue this journey through Alex’s life, but I also want to close out my project. I have come up with the following plan: I will continue to document Alex’s life, mostly important events, successes, and challenges, as Alex moves through high school, the transition program and adult living. I will do this in a chapter format and call the next group of entries “The Ordinary Life of an Extraordinary Girl – Junior year”. Thanks for all the words of support. 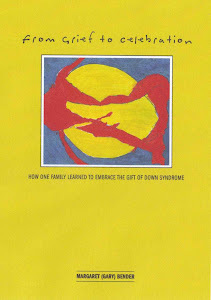 I hope our story can make a difference in the life of a young baby with down syndrome; today and in the future. Sounds like a good plan for the future. I'm so glad you are going to continue telling Alex's (and your!) story! Like you we want both to celebrate and to educate. I, too, am following with an eye to our future. My daughter is 7 and has DS...I'm glad you will continue to chronicle, and thank you for sharing!